A rare 1830’s white cotton summer cape. The cape is all hand stitched and the initials F. H. are hand stitched with red thread inside the neckline. It has a ruched collar and armhole openings. The bottom hemline is trimmed with a wide ruffle. The collar, armhole openings and bottom hemline ruffle are all piped. The cape is unlined and has a tie front closure. The cape is in excellent and clean condition. There is one tiny split on the back shoulder area. Antique clothing is for display/collecting and should not be worn. Shoulders 15 length 42. 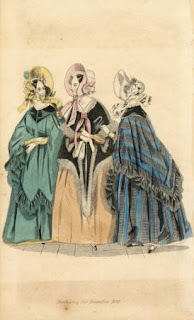 Notice the one from the 1830's has shoulders and looks to be pointed in the back and front. Granted, these are winter capes, but I honestly couldn't find any fall/spring ones. 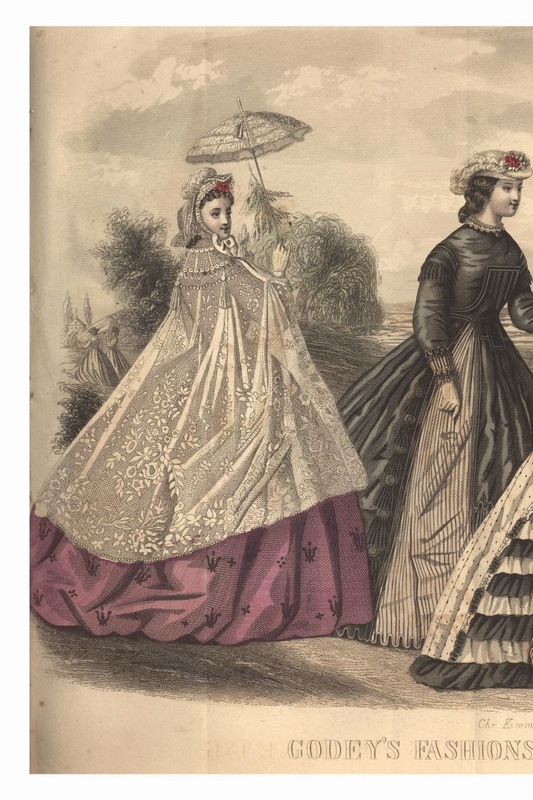 The other fashion plate, from 1864, shows a very similar cape to the extant one. It simply is missing the bottom gathers.